NOW WITH FREE SHIPPING! BUY 5 AND GET THE 6TH 50% OFF (must add qty 6 or more to cart for discount to calculate)! Why the Affordable K-9 Kondo Is the Best! The K-9 Kondo is more than durable...it’s practically indestructible. It’s rot-proof and insect-proof. And it’s the only doghouse on the market guaranteed to be completely chew-proof. You’ll never need another doghouse. The K-9 Kondo is convenient. It’s lightweight so it can be moved to or from a truck with ease, and cleanup is a breeze. You don’t have to worry about water absorbing into a wooden floor, or even moving it. Simply clean inside or underneath with a hose. Feature for feature, this affordable doghouse is comparable to other manufactured doghouses that cost twice as much. Since it will last a lifetime, the K-9 Kondo even offers substantial savings in time, energy, and money. The affordable K-9 Kondo is much longer-lasting than a homemade doghouse that will need to be replaced. K-9 Kondo isn’t just preferred by dog owners. It’s preferred by dogs, as well. When given the choice, dogs almost always choose the comfort of the K-9 Kondo over other types of doghouses. Research shows that dogs prefer to sleep in shallow, curved holes. The curved, natural shape of the interior surface of the K-9 Kondo effectively satisfies this natural “nesting” preference. As a result, dogs take to the K-9 Kondo better than any other type of doghouse. And they are guaranteed to stay warm, too. With the K-9 Kondo, your dog won’t have to worry about freezing his or her tail off. Guaranteed “winter warm,” tests show the K-9 Kondo equals or exceeds the warmth of other manufactured pet houses. The K-9 Kondo is even guaranteed to be “summer cool.” With a unique ventilation system and heat shield deck, the interior stays within two degrees of shade temperature, even in direct sunlight. And dogs just love to sun themselves on the deck. Unlike other dog flaps and doggie doors that actually channel rain inside, the K-9 Kondo rain shield and kennel door prevents even wind-driven rain from getting inside. Even with six inches of standing water outside, the dog flap for the K-9 Kondo is designed to keep your dog warm and dry as a bone. If you or your dog is not completely satisfied with this affordable doghouse, we’ll give you a full refund of the purchase price within 30 days from the time of purchase. No questions asked. Each K-9 Kondo comes backed by a five-year (see warranty page for details). If you experience a problem, we’ll take care of it. Guaranteed. $124.95 (includes free shipping) for the kit to convert your own barrel into a lifetime doghouse. Plywood decks and barrels are not included. Have more questions about our affordable doghouses or accessories? 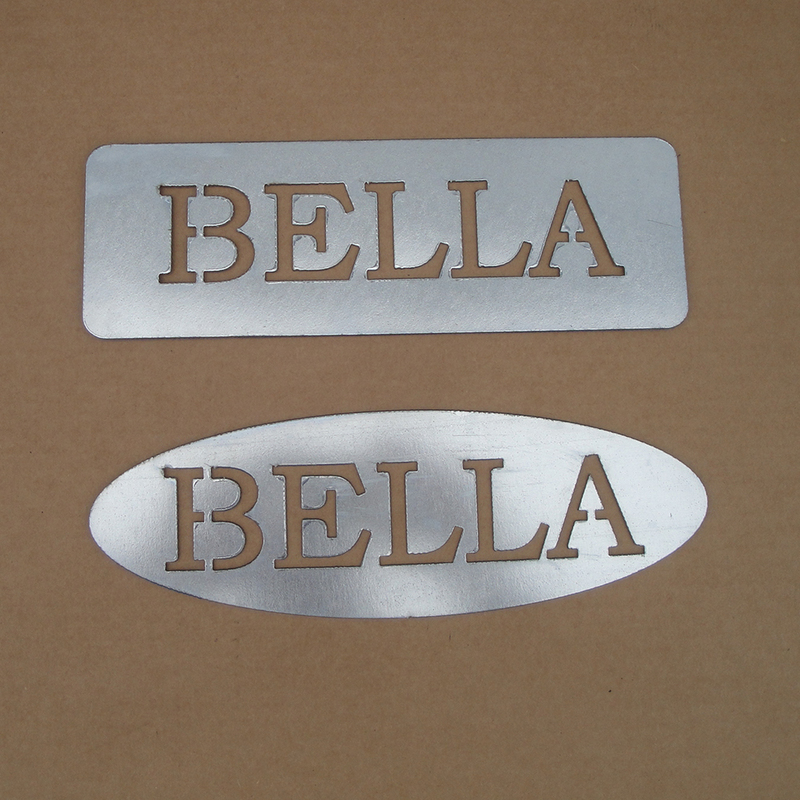 ALL NEW OPTIONAL NAME PLATES FOR $10 (2 for $15*)! Give your pet's doghouse or kennel that special touch with a custom metal sign showing your pride in your best pal. For only $10.00 with your order of any K-9 Kondo product you can have a 12 x 4 inch custom seven letter sign cut from rugged 22 gauge steel. Hang it on a wall, kennel fence, Dog Den, or K-9 Kondo. Select either oval or rectangle in the products options above, then spell out the dog’s name using up to seven letters in the text field provided before adding the product to your cart. * If getting a second name plate for the additional $5, it must be the same name and design as the first name plate. A 55 gallon barrel and the door, base and top platform attachments that come with the kit. As you see it was one of my favorite investments in the dog. Finally a house that isn't a large chew toy and doubles as a great winter shelter for a dog with thinner fur coat. We love the K9 Kondo and will get another if we get another dog. I also love it's off the ground quite a little distance so snow doesn't block the door from opening. Great dog house. Secure and weather proof! The build of the kit takes a lot longer than I was anticipating, but the product is great once it's put together. It was helpful to have the videos that help tech your dog how to come in and out of the house. After that, my dog has really taken to it! This is one of the best dog house kits I've ever seen! Easy to set up and the dogs love it! I will be buying more products from k-9 kondo. Assembly is a nightmare. Throw a bag of rivets and washers in and it would make life so much easier. Great product after assembled. Now just waiting for the 3,000 screws to rattle loose. I have 4 barrel kondos, 2 tied together by a full sheet of plywood for a sundeck each. Am down to only 2 dogs now, but these are still the best dog houses! Have had my 4 for ~10+ yrs. Just made 2 more singles...for my daughters' dogs as they've moved away. Instructions ARE a little cryptic. Especially as it regards screws. Needs a diagram of screw inventory, to ease that process. And longest screws don't work with 3/4 ply board for sun decks, but easily remedied with a quick trip to the lumber yard! Will always house my dogs in K-9 Kondos! Great product but needs a little tweaking. There is very little "lip" below the door on the K-9 condo kit making it difficult to get much depth in the bedding. The dog drags some bedding out each time he exits the barrel. If the door were a little shorter there would be more lip at the bottom to keep cedar shavings, hay, straw in the barrel. Maybe if I had used a bigger diameter barrel but the barrel I used fell within the size specified. Hound Heater Delux Pet House Furnace, 110 Volt - FREE SHIPPING! Click the button below to add the K-9 Kondo - FREE SHIPPING! to your wish list.